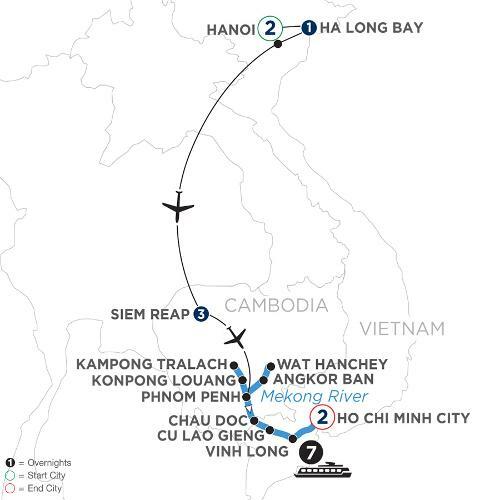 Day 4 HA LONG BAY—HANOI—SIEM REAP. DISCOVERY This afternoon, enjoy scenes of daily life on Cu Lao Gieng Island via sampan and local motor cart. Your Guided Excursion starts with a stop at one of Vietnam’s oldest Catholic churches. Then, visit the home of a local family that makes Vietnamese conical hats, or “Non la,” from materials available to them such as palm leaves and bamboo. These iconic hats are primarily used as protection from the sun and rain but you may also see them used as a basket to carry home goods from the market. Lastly, visit a local workshop where a skilled family handcrafts sampan boats. Day 15 HO CHI MINH CITY. EXCURSION TO CU CHI TUNNELS. Participation in this vacation requires purchase of the following flights from Avalon Waterways, not included in pricing: (1) roundtrip air from your U.S. gateway and intra-vacation air segments; or (2) intra-vacation air segments only, starting at $400. Required intra-vacation air segment: Hanoi/Siem Reap; Siem Reap/Phnom Penh. Air prices were effective on February 6, 2019, and their availability is limited. At the time you purchase your tour, air prices may be higher.